Bleed is an area of print at the edge of the document that gets trimmed off after printing. That means you need to make your artwork slightly bigger, so it can be trimmed down to the right size. When print is cut to size, the cut isn’t always 100% accurate. If you don’t add bleed, you risk having a white line at the edge of your print where the artwork ends. Luckily, adding bleed is pretty straight-forward. The videos at the end of this post will show you how to add bleed to your artwork. Still confused? Don’t be! Here are some videos we made earlier. Got any print blunders to confess? Spill the beans in a comment below! A common print mistake is pixelation – read all about it (and how to avoid it!) here. Love this! sharing this to my team! the bleed area caused me issues elsewhere where a rival just printed regardless. At least with yourselves if there is a sizing issue i am contacted and asked to correct. Thanks for the handy print guide Dan! Now here is a nice and handy print guide to share. 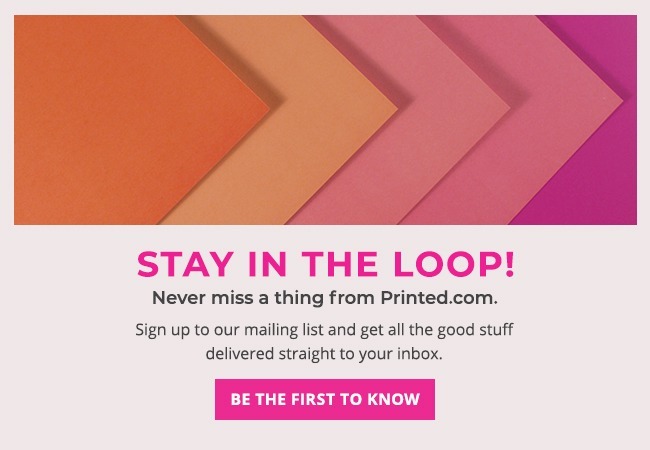 It has lot’s of benefits and is a great way to spread the word about printed.com. But shouldn’t designers use a proper program for the actual page layup such as Indesign or Quark. Indesign – for assembling the objects and required text on the page. Yes yes yes we all know you can use Photoshop and Illustrator but surely wouldn’t Adobe have created a singular application that does it it all properly? From my past experience (17 years print production & pre-press) some (not all) artists that use Photoshop are very good at creating lovely images in photoshop but not great at presenting the final printable item. @Paul Newman – I totally agree, and we do just that in the team here – we use illustrator for shapes/vectors, photoshop for web/image manipulation and indesign for print prep. Creative suite is brilliant if you take advantage of dynamic linking and jump between packages. Luckily InDesign doesn’t present a problem with colour modes. It’s also a program that rookies tend not to purchase until they realise the benefits. Most people tend to have more knowledge in photoshop or illustrator, like you say, and expect to have to export from there. I’m a Quark fan for typesetting, vectors and more elaborate type in Illustrator, and image edits in Photoshop, I will never use text in PS – gahhh. I also use indesign, at clients request – i.e if they want the original file, but I personally refer Quark. I made my first mistake in 10 years today – busy week I set my margin/guides to 4mm and not 5mm, so my file got returned!! As an amateur designer, this reeeeeeally comes in handy. I def. will have to bookmark this page. There are some really helpful tips here, especially re. bleed & re. black colour values. I’ve had some issues with text in black previously, and this may be why… Thanks! Besides the design aspect of things, I think the number one rookie error is forgetting to correct spelling mistakes. Sounds like a no-brainer, but it happens! Great guide, even for an experienced designer there are very useful tips in this. Thanks for providing the screenshots on RGB vs CMYK color! that’s really helpful.